Almost one out of every ten artifacts unearthed from the ruins of the ancient city of Mohenjo-daro in present-day Pakistan were play related. Have archaeologists been underestimating the social significance of play and games? Elke Rogersdotter from the University of Gothenburg in Sweden certainly thinks so. She's been studying the artifacts unearthed at one of the earliest urban settlements in the world, and she's written a thesis exploring the importance of gaming to the area and to human culture as a whole. It's not that archaeologists haven't discovered game-related artifacts before. It's the fact that they've generally been written off as insignificant hobbies, much like many people do with video games today. "They have been regarded, for example, as signs of harmless pastimes and thus considered less important for research, or have been reinterpreted based on ritual aspects or as symbols of social status," explains author of the thesis Elke Rogersdotter. It makes one wonder what the archaeologists of the future might think when they dig up our Xbox 360 controllers and unearth our video game collections. Will they repurpose the tools of our hobby as ritual items? I suppose to some of us they are ritual items, but I digress. 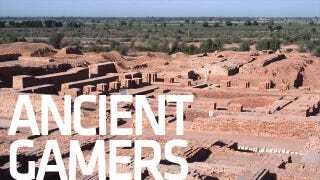 The ancient city of Mohenjo-daro was founded some time before 2600 BCE along the Indus River in what is now modern-day Pakistan. Between its founding and its abandonment in 1500 BCE, the people there played plenty of games. The frequency of gaming-related artifacts unearthed by Rogersdotter is impressive, but so is where those artifacts were found. Rather than being scattered about the entire area, gaming artifacts were found littered about certain locations, suggesting the inhabitants had areas dedicated to play and gaming. This structured distribution shows that gaming was an important part of daily life as far back as 4,000 years ago. Rogersdotter believes that play and game-related materials are ignored or reinterpreted due to scientific thinking's difficulty handling the irrational phenomenon of games and play. Perhaps it's time science adjusted its thinking. "The objective of determining the social significance of the actual games therefore, in turn, challenges established ways of thinking. It is an instrument we can use to come up with interpretations that are closer to the individual person. We may gain other, more socially-embedded, approaches for a difficult-to-interpret settlement."